Iranian-born Gelareh Kiazand, 35, graduated in media from Toronto, and has worked in major Hollywood film productions alongside Brad Pitt, Bill Murray and Tina Fey, but it’s her independently directed documentaries on such subjects as plight of women, civilian war casualties, Climate Change, and fading cultural heritages that have not caught the eyes of the world. Kiazand’s parents left Iran for Dubai in 1986, and she was brought up between Abu Dhabi, London, and Toronto before returning to Iran in 2003. Since then, she worked as photographer and cinematographer in Iran for six years. 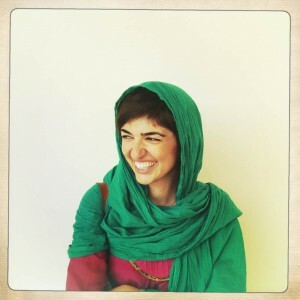 Her work has exhibited at Iran’s Museum of Modern Arts, and nominated three times for best film photographer. She has also worked as reporter in Afghanistan and India – and broadcast correspondent for Vice News – run by Josh Tyrangiel, a Zionist Jew (watch a video below). You can read more on her personal website, here. On January 30, 2017, Tehran Times published an interview with Gelareh Kiazand. So what you think Rehmat? Is she a useful idiot for her arch Zionist boss at Vice News? I find most Muslim journalists being LAZY – because they never bother to check the rascals behind their organization or news source. For them, what is reported by BBC, CNN, JYT, WSJ, etc, is Word of G-d.